1. A Visitor Center - right now visitors have nowhere to wait for their tours to start or sit and relax afterwards that is safely outside of the compound! 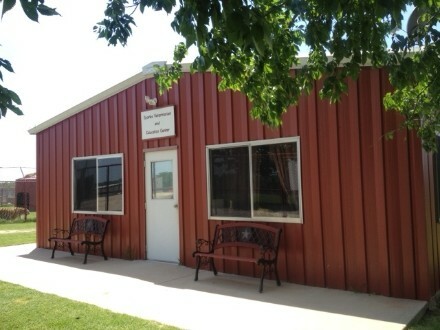 Currently visitors are allowed into the Vet Center to wait and use the restrooms. However, this really is not the purpose of that building. The Vet Center serves as not only the critical care facility for sick/elderly animals and animals recovering from surgery, but it is also our intern housing. Both the animals and our interns need a quiet space to call their own when they are tired or stressed. This also means that, being inside the gates, a CARE staff member must be there with our visitors at all times while they wait or use the restrooms, taking them away from other essential activities. The new Welcome Center will be a safe, indoor/outdoor area where visitors can sit down, talk, refresh themselves, and browse CARE merchandise and information. The Vet Center where the interns live and where sick/injured/recovering animals are kept - there is immediate access to all of the animals' enclosures from the Vet Center - not a great place to have people waiting unattended. 2. An Administrative Office - Currently CARE itself does not have a office where directors and volunteers can conduct business effectively. Our Executive Director, Heidi, has an office in the living room of her personal residence at CARE. This means board meetings are held there, special visitors to CARE are entertained there, and volunteers come in and out to discuss CARE business. Heidi and her family have been extremely welcoming and gracious in opening up their home to a multitude of people, but it is taxing on them and not the best environment for CARE's staff to get things done. The new Welcome Center would also have a private office where staff can focus, and a family's personal space is not invaded. Now, we have done our research and we estimate this building will cost $20,000 to complete. We are assuming that the labor will be done with no or minimal cost, so $20K is a steal for a project like this! We have also been given a huge gift by our long-term supporters at the Dallas Furry Convention, who provide us critical funding every year. We are ear-marking $5,000 dollars from their annual gift this year specifically for this project. Additionally, our Operations Director Derek has a HUGE following on the social media app Vine (over 280,000 followers). He has personally asked all his followers to help support this project by donating $5,000 in his #squeakstrike campaign. You can see his fundraising efforts and progress here: http://www.gofundme.com/carewelcomeproject. So, that leaves us with only $10,000 to raise and we have 3 WEEKS to do it! If we can accomplish this, everyone that is a part of CARE including staff and supporters, will benefit. This is game changing for us, so please donate today to help us reach this goal by May 25th!